Take the water where you want it with the AQUA JOE heavy-duty garden hose. The 5/8-inch flow, kink-resistant 75' hose features durable zinc fittings for secure, leak-proof connections plus a protective bend-restriction sleeve for uninterrupted flow. Constructed of rugged, kink- resistant high-grade PVC for maximum durability and performance. Lead-free, phthalate-free and BPA-free. Perfect for watering the flowers, washing the car, rinsing patio furniture or connecting to a lawn sprinkler. 5/8-inch x 75 ft. Heavy-Duty Garden Hose Take the water where you want it with the AQUA JOE heavy-duty garden hose. 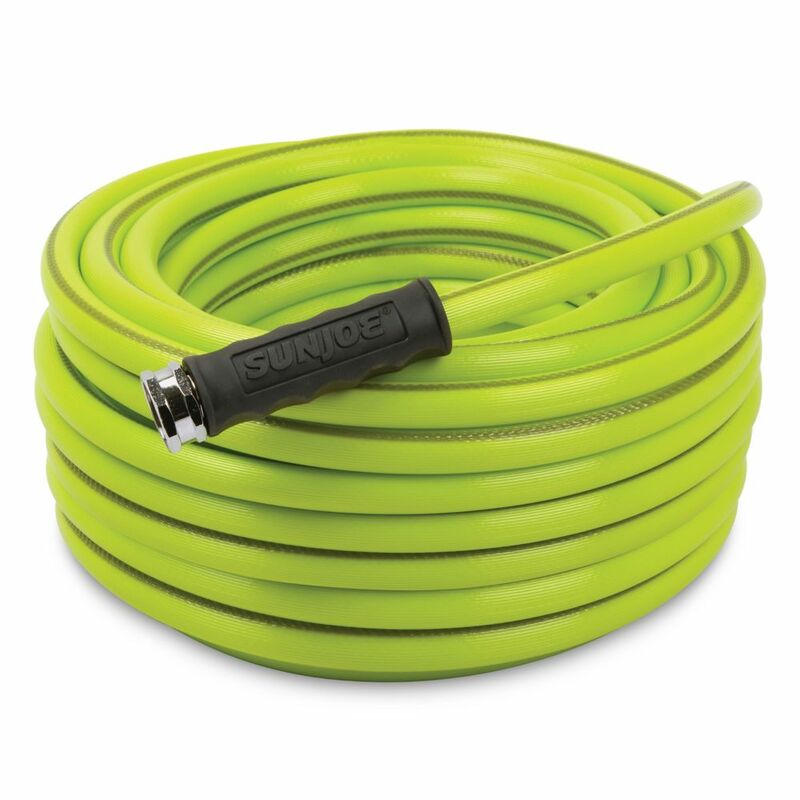 The 5/8-inch flow, kink-resistant 75' hose features durable zinc fittings for secure, leak-proof connections plus a protective bend-restriction sleeve for uninterrupted flow. Constructed of rugged, kink- resistant high-grade PVC for maximum durability and performance. Lead-free, phthalate-free and BPA-free. Perfect for watering the flowers, washing the car, rinsing patio furniture or connecting to a lawn sprinkler. 5/8-inch x 75 ft. Heavy-Duty Garden Hose is rated 3.8 out of 5 by 24. Rated 3 out of 5 by Brett from This hose does kink, probably because it is so lightweight.... This hose does kink, probably because it is so lightweight. Uncurling it is frustrating, because it is lightweight. I used it once. It is not your father’s garden hose, which is what I was looking for. I went ahead and ordered a heavy duty rubber hose, twice as heavy as this lightweight one. Rated 4 out of 5 by Pat from A very sturdy hose.... A very sturdy hose. Rated 5 out of 5 by Berdesany from Works Well Now for the Hose seems to be working fine Anther A+ not much to say but works well. Rated 4 out of 5 by golfer52 from The hose is lightweight as promised which makes it easier to roll off and on the hose reel. It is... The hose is lightweight as promised which makes it easier to roll off and on the hose reel. It is not, however, totally kink resistant. Rated 5 out of 5 by Anonymous from So easy to use! Doesn't kink. Rolls up easily on the cart. I'm very pleased with this hose. So easy to use! Doesn't kink. Rolls up easily on the cart. I'm very pleased with this hose. Rated 1 out of 5 by Jim from This hose kinks very easily. Returned to store after three... This hose kinks very easily. Returned to store after three weeks of use. Rated 5 out of 5 by Thumbs from The hose is kink-resistant, not kink free. So far, it's doing a good job. The hose is kink-resistant, not kink free. So far, it's doing a good job.